Soon after Thomas Dougherty started work as a researcher at Roswell Park, he had an idea about how to make a century-old concept of killing cancer cells with light into an effective weapon against the disease. His brother, Joseph Dougherty, said Dr. Dougherty shared his idea of combining laser light with a non-toxic, light-sensitive drug with several medical doctors, all of whom assured him it could not be done. Thousands of cancer patients who benefited from Dr. Dougherty's breakthrough have his stubbornness to thank for their treatment, and in many cases, for their survival. Dr. Dougherty, the developer of modern photodynamic therapy (PDT) and chief emeritus of Roswell Park’s Photodynamic Therapy Center, passed away Tuesday, Oct. 2, in Highland Hospital in Rochester, NY. In 1970, Dr. Dougherty left a job with the DuPont chemical company to join Roswell Park’s Department of Experimental Biology as a research associate. Here, he developed photodynamic therapy, a cancer treatment that combines laser light with a nontoxic, light-sensitive drug. The process kills cancer cells directly and also shuts down blood vessels in the margin around the tumor, reducing the chance that cancer cells left behind will be able to grow. Studies indicate that it also stimulates the immune system to track down and kill cancer cells throughout the body. Although PDT was first discovered more than a century ago in Germany, until Dr. Dougherty’s breakthrough, researchers could not find ways to use light-sensitive compounds to treat the disease. Dr. Dougherty successfully treated cancer with PDT in preclinical models for the first time in 1975. In 1998, Dr. Dougherty told The News, "I doubt if there's another place in the entire world where I could have done what I did here. This whole experience at Roswell Park has been so unique and it just happens to be in my own backyard." In 1994 the FDA approved PDT with the photosensitizer Photofrin for palliative treatment of advanced esophageal cancer. Today it is also FDA-approved for the treatment of specific types of lung cancer and Barrett’s esophagus, a condition that can lead to esophageal cancer. 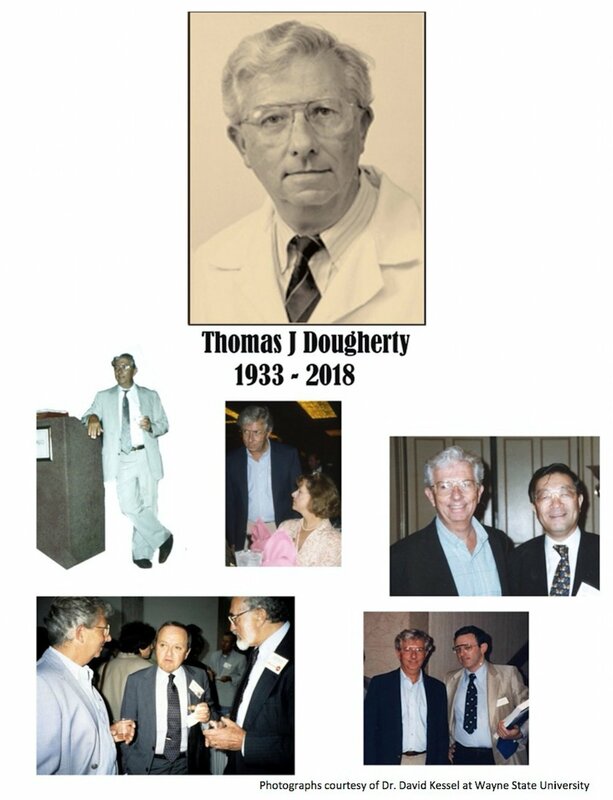 After selling his company, Photofrin Medical, Inc., to Johnson & Johnson in 1984, Dr. Dougherty used the proceeds to establish The Oncologic Foundation of Buffalo, which initially funded PDT research at Roswell Park. The foundation later expanded to support initiatives at Canisius College, the American Brain Tumor Association, and Hauptman Woodward Medical Research Institute. It also funded a program that taught University at Buffalo medical students "how to deal honestly and compassionately with terminally ill patients," Dr. Dougherty once said. He received numerous accolades and awards, including the Lifetime Achievement Award from the American Society for Photobiology, the Sullivan Award, Ohio State University’s highest honor for a graduate, the Benjamin Franklin Award for the Betterment of Human Health, Western New York Inventor of the Year, a 2006 Pioneers of Science award established by Nobel Laureate Herbert A. Hauptman and a Doctorate of Humane Letters from Canisius College. He was the author or co-author of more than 200 publications and held more than 50 patents. "Tom certainly left the world a much better place," said David Kessel, professor of pharmacology at Wayne State University School of Medicine in Detroit. "He was one of the 'good guys' of whom there can never be enough." Dr. Dougherty’s 1983 trip to China to lecture on photodynamic therapy was the subject of a 30-minute special on CBS. Thomas Dougherty attending various meetings and conferences over the years.